The Easter that I was in 5th Grade, I received in my Easter basket, a razor. Which, upon Googling to find a picture, was first manufactured in 1971, and discontinued after 35 years on the market. May the Flicker rest in peace. Now, I should tell you, I was HORRIFIED to find this in my Easter basket. But, apparently my mother had noticed the small thatch of dark hair growing under my arms and felt it was time to intervene. I'm sure I'd noticed it, but I'm not sure I had a burning need to get rid of it. I was supremely embarrassed by this "gift". I believe it was around the same time I was gifted with deodorant. Lucky me! I ended up with a bra within a few months of the Flicker, although I didn't need it, strictly speaking. I was actually really careless about wearing one until 7th grade, and at that point, it was a full-time thing. I kind of even needed it. My period came about eight months after the Flicker. But enough about my developemental milestones. What I really want to talk about is shaving. I'm terrible at shaving my legs. I always try to do a good job and then I get out into broad daylight and realize half of a knee is still unshaven. Or I missed a patch near an ankle. I had to buy new razors the other day, and I cut a small nick on the left leg first thing. And that's when I remembered something I've been reading in beauty mags for years. Since Seventeen and Sassy. May Sassy also RIP. They say you shouldn't shave with a dull blade as you're more likely to cut yourself. I cut myself constantly when I shave my legs. I have permanent chunks missing from various locales all over my legs. I've cut myself with dull blade and brand new ones equally. 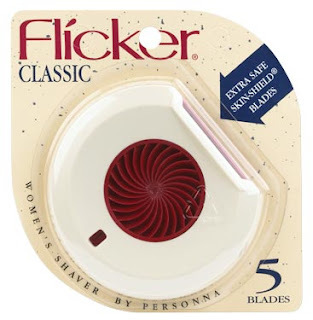 I maintain that the "fresh blades often" mantra that Cosmo, et al. are spouting is really because of a kickback they get from Schick and Bic and Gillette to mention that in every issue. I am, perhaps a conspiracy theorist on that one. I don't care. And I will tell you - expensive razor are really nice, but they don't do that much better than a 99 cent knock-off of the pink Daisy razors I graduated to after the Flicker gave up the ghost. I should also tell you, that from that point forward, one of the omnipresent stocking stuffers at Christmas was a package of disposable razors. And I loved getting them.